To create a real sense of destination, the approach to a house-however long is absolutely critical, especially when the time comes to sell. As a result, the choice of surface for your driveway requires thought and, under certain circumstances, some not inconsiderable investment. ‘Getting the details right here gives potential buyers confidence that what they’re about to see is well managed,’ believes Philip Eddell of Savills’ country-house consultancy. There’s no one-size-fits-all answer: an appropriate surface for a drive in a London suburb will differ greatly from one that works for a country house. The developers of Updown Court, a 24-bedroom mansion in Surrey that languished on the market for years with a £70 million price tag, are thought to have spent several million pounds on a heated marble driveway. 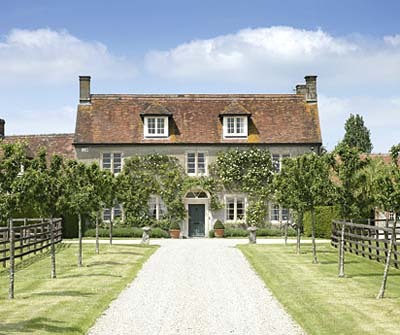 For uncomplicated country-house drives, most agree that gravel makes the right impression. Although it can be tiresome, and messy, and requires replenishing every few years, it’s ‘infinitely preferable to jet-black Tarmac, which can be inappropriately municipal,’ observed architect Ptolemy Dean (Country Life, April 26, 2006). The key is to use a good sub-base and choose the right kind of gravel. ‘It’s no good intro-ducing the sort of riverbed pea shingle suitable for driveways in the Thames Valley into the Cotswolds, where crushed limestone was traditionally used, or in Scotland, where crushed granite chippings are the norm,’ advises Mr Dean. ‘As ever, the key is to look carefully at local traditions and to respond accordingly.’ In areas where weather conditions are more extreme, it might be wise to create drainage ditches on the side of your gravel driveway. For more complicated driveways, those that have a steep incline, or for anyone looking for a low-maintenance option, probably the best option (albeit the most expensive one) is resin-bonded gravel. ‘For a senior house with a senior approach, this is the best long-term solution,’ believes Mr Eddell. It involves laying normal Tarmac with fine gravel bonded onto its surface, so that it looks like gravel. Even if it doesn’t sound quite right, it’s aesthetically pleasing and easy to maintain. ‘It looks the part and doesn’t wash away,’ says Russell Hill of Haringtons UK. ‘You’re left with a gravel feel, and it solves the problem of sloping drives.’ Another added advantage is that, during dry weather, there isn’t the issue that’s commonly found with gravel driveways of dust being kicked up by cars. ‘Picture a lovely manor house. The owners are having breakfast outside in the summer when the postman arrives in a cloud of dust,’ cautions Mr Eddell. ‘With a resin-bonded driveway, this won’t happen.’ A cheaper (if less elegant) finish would be to mix the gravel with some tar to hold it in place. This can also be used on sloping driveways, adds Edward Heaton of Property Vision. Walking, wheeling a bike and pushing a buggy are far easier on Nidagravel than on normal gravel. It uses a special system that involves laying gravel on polypropylene sheets with a honeycomb structure. The sheets are laid on a suitable sub-base, and gravel is then spread on top, making them invisible. The surface is porous, so there’s no need for special drainage systems, and the fibreglass membrane prevents weeds from growing through. You are, however, advised to regularly inspect the top layer to ensure there’s sufficient gravel sitting above the sheets to avoid them being in direct contact with cars. The system is able to handle frost, but, if a snowplough is used, make sure the top layer of gravel isn’t scraped off.